So many people recommended versions of Devdas when I started watching Indian films. Prior to seeing the Telugu Devadasu, I’d watched a few of the various adaptations in Hindi. I have mentioned before that the role of Tight Slap Administrator could be a dream job for me, but honestly I would have been exhausted about an hour into any film version of Devdas. I prefer romances to involve people I can care about to some extent, otherwise why bother? Whether we’re talking whinging Dilip Kumar, tear drenched Shah Rukh or aggressively self centred Abhay Deol, Devdas is one of my least favourite characters. This is a drawback when the story is just a long wait for Dev to work out how to drink himself to death. So it was a bit of a surprise to find myself not exactly liking but empathising with Devadas (Akkineni Nageshwara Rao) and feeling quite kindly towards Parvati (Savitri). Maybe it was the lack of subtitles that let me reshape the story to suit myself. I certainly had no trouble following the story – there are so many adaptations of the book by Sharat Chandra Chattopadhyay it’s almost a plague – and it’s easy to find a synopsis if you need one. 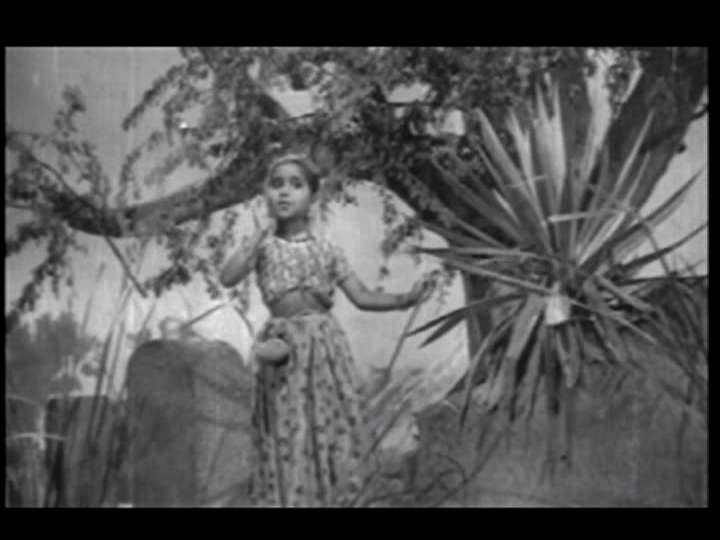 Director Vedantam Raghavaiah’s version opens with Devadas and Parvati as little children, partners in crime, tormenting their teachers and causing mayhem. Devadas demands her obedient following, Parvati demands to be spoilt and adored and generally that is how things go. If one upsets the other, they retaliate with no thought of the consequences. And that sets the tone for their whole relationship even as they grow up. When he was sent away to school, he seemed to become that rich kid who funded his friends’ adventures and went with the flow. Meanwhile Parvati waited at home, confident he would come back and she would be part of his life. 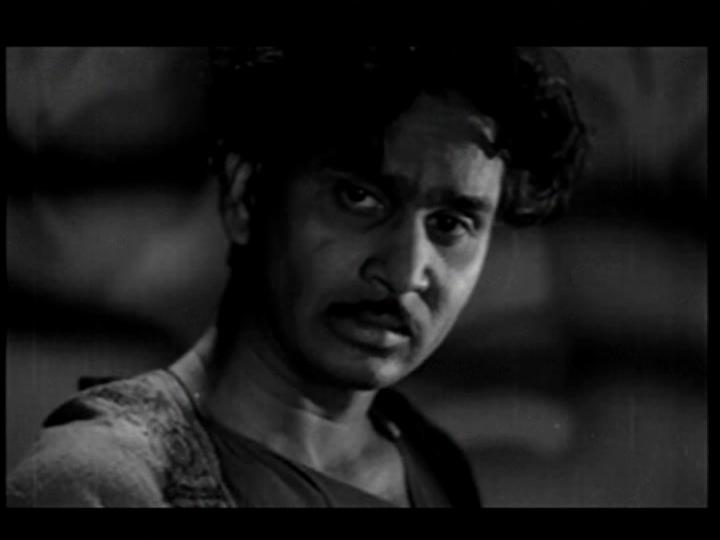 ANR’s Devadas is a man who knows he has screwed up and has no one else to blame. He conveys the frustration of a young man caught under the thumb of his domineering father (SV Ranga Rao), and the weakness that paralyses him. He and Parvati realise that they can’t continue to be inseparable as they were in childhood without formalising their relationship. There are some really lovely scenes early on when he and Parvati are rediscovering each other, as in this song. There is also the infamous scene where Devadas strikes Parvati in retaliation for her pride. 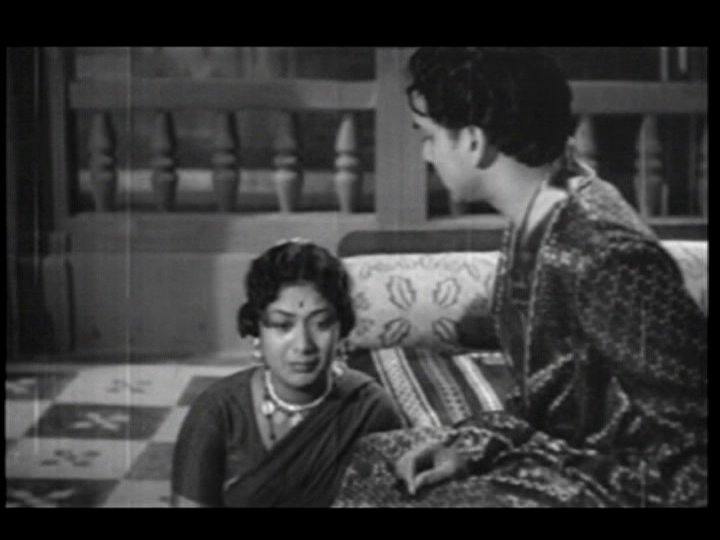 ANR looked appalled and remorseful after lashing out so viciously and Savitri portrayed a mix of shock, anger and sadness that spoke volumes about the way their relationship still played out. Her parents proposal is rebuffed as they are of a lower social status, and suddenly time is running out. Parvati sneaks into his room to beg him to marry her before she is married off elsewhere but he cannot stand up to his dad (or whoever chose these pyjamas for him). And so he loses her, cuts ties with his family and is ripe for a decline into self pity and booze. Later, when Devadas returns home following his father’s death, he sees the married Parvati. They have a beautiful scene together where suddenly the old Devadas is visible just for a moment. They light up in each other’s presence even as they break down. He has no resilience or motivation – he is carried by the currents of luck and money and when the luck is bad, he doesn’t know how to change things. His refuge in alcohol initially makes him happy as he hallucinates seeing Parvati. Once the addiction has hold of him, the euphoria starts to disappear and he becomes a shambling wreck. ANR portrays the gradual descent into self destruction very well. While I think Devadas is an idiot I had to look away in some scenes because he was so painfully frail and damaged. Parvati is a minx and gets her own way but she isn’t completely obnoxious. Savitri does a wonderful job of showing Parvati using her childish impulsive ways but aware of Devadas’ attraction to her, experimenting with her sexual appeal. When she sees Devadas after he has been at school for so many years, her affection is obvious. They talk about his father’s objection to her proposal and there is little game playing when it counts. When she is married off to an elderly widower who really seems to want a nanny more than a wife, her grief is evident but she tries to fit in. I wasn’t quite sure about the physical side of her marriage – her husband mostly treats her like a niece or daughter, but there was one scene where he said something and Savitri looked quite ill and horrified so I wondered if a conjugal visit was on the cards. She is affectionate towards her stepchildren and wins over her jealous sister-in-law. She really does make the best of it and the kids seem very fond of her so her life isn’t shown as empty without her first love. In the final scene where she realises Devadas is near and tries to see him before he dies, the family seem to stop her because they are worried, not to punish her or protect their honour. Thanks to Savitri’s nuanced acting I really felt for Parvati. 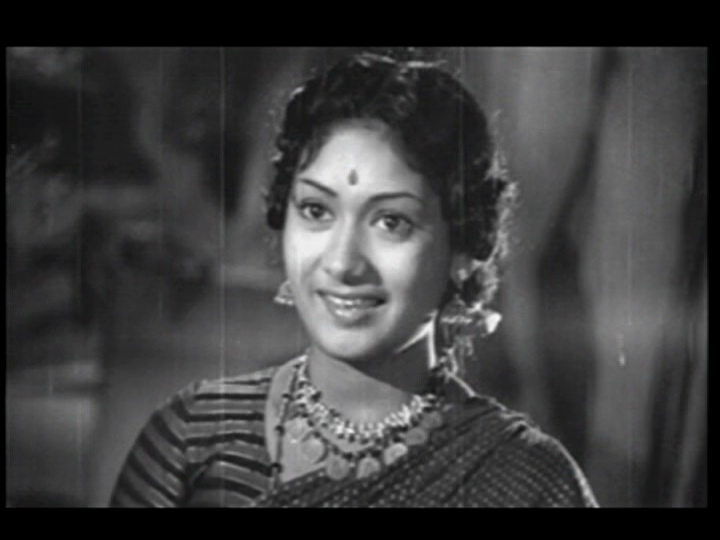 Lalitha, one of the renowned Travancore sisters, is Chandramukhi, the other woman who loves Devadas. Her role is important but doesn’t occupy as much screen time since Devadas usually prefers to pity himself in solitude. She is flirty and practiced, a woman who knows what men want and knows she has it. Despite her commercial nous, she can’t resist the misery of her newest and most reluctant client. While he initially rejects her, a relationship of sorts does grow over time. She is prepared to lose her livelihood over him and argues with her staff, including a comically inclined orchestra, as she cuts back on working. When Devadas really deteriorates she searches for him and brings him home, offering practical care to keep him comfortable. 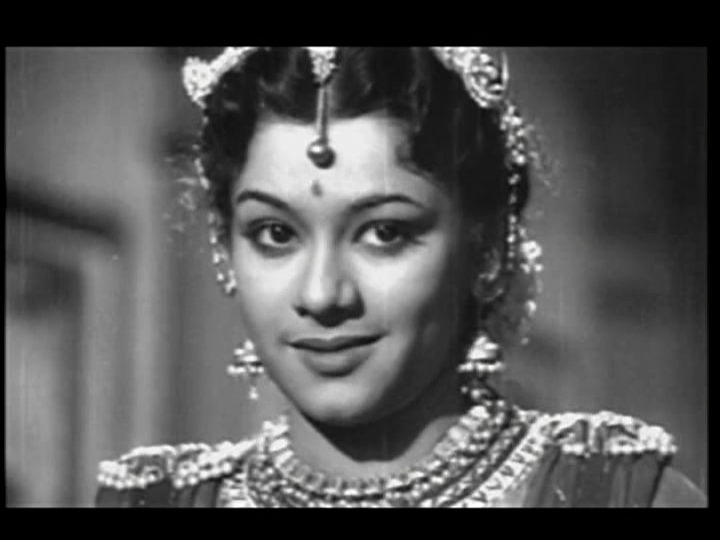 Lalitha has great physical presence and really suits Chandramukhi’s self aware femininity. Her dancing is assured and she displays her body with confidence, again a perfect fit for this character. I liked the less grandiose sets in this version as they suit the characters and allow them to be the focus. The music is lovely and as the duets often take the place of conversations, they fit the mood of the scenes. The dances at Chandramukhi’s brothel are quite simple and she performs alone to entertain her clientele – it’s clear what she is selling but the scenes aren’t overly vulgar. It is really hard to comment on the technical aspects of the film as the DVD picture and sound are so bad, and there are clearly some scenes missing and abrupt edits. Once again I will have a whinge about the terrible print quality of a classic film, and wonder why this is almost the norm. If so many people can recommend a movie as a classic of their industry, why doesn’t anyone take on the task of preservation and restoration? I’m not sure who most of the supporting actors are, but they were all very good and suited their roles. Anyway – I’ll never wholeheartedly love the story of Devadas and Parvati, but this is my favourite version to date. See it for the excellent acting that made two silly fools seem more relatable than I expected, and for some beautiful melodic songs. 3 ½ stars. Heather says: Devdas has never been my favourite story, perhaps because the first version I saw was Sanjay Leela Bhansali’s extravagant epic and I found it difficult to relate to the characters. However I’ve appreciated some of the earlier Hindi film versions a little more, and now agree wholeheartedly with Temple that this Telugu version is the best. Devdas is certainly not an attractive character at all. He’s arrogant and selfish; almost child-like in his inability to deal with the world and ANR captures this perfectly. 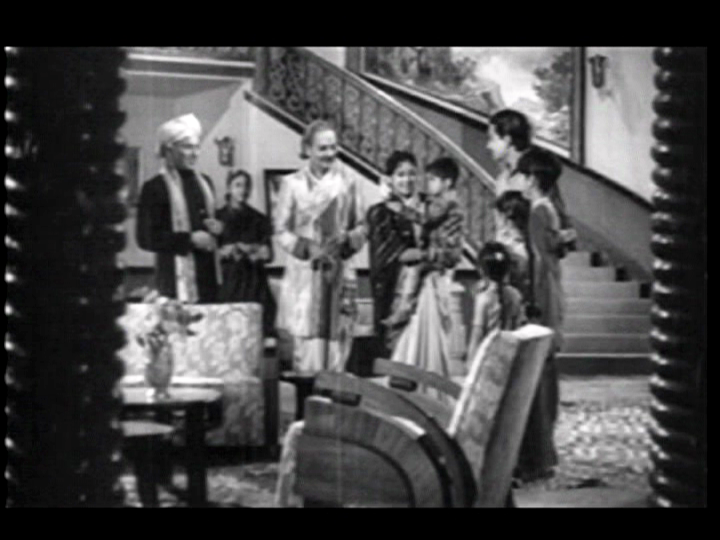 In the early scenes his conceit takes centre stage and despite the lack of subtitles his inability to deal with his family’s disapproval of Parvati comes through clearly. 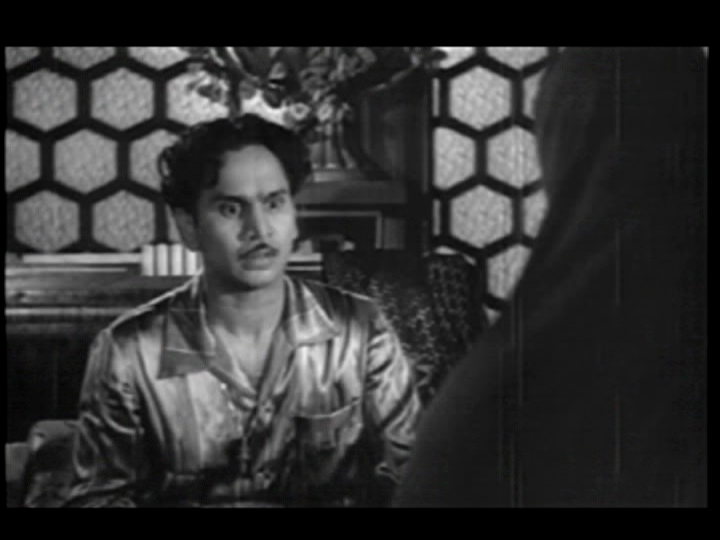 As Devdas falls into self-recrimination and takes up a decadent lifestyle, ANR’s portrayal of the shattered and hopeless alcoholic almost manages to wring some sympathy, despite knowing that he brought it all on himself. So even although I want to dislike Devdas (and usually do), ANR makes his weakness understandable to such an extent that I end up pitying him. It really is an outstanding performance. I agree with Temple that Savitri is excellent here as Parvati, giving her innocence and a child-like adoration of Devdas which makes her later actions more reasonable. I also loved Lalitha in her portrayal of Chandramukhi, but my favourite actor is the little girl who played the young Parvati. Her eyes were incredibly full of expression for such a young actor and every emotion was written loud and clear on her face. I ended up watching her scenes over and over again and would love to know who she was. Anyone know? It is such a shame that this film isn’t available with subtitles as much of the beauty in other versions of the story is in the dialogues. I will add my plea that someone needs to please restore and re-release all these old films before they are too far gone to salvage, preferably with English subtitles too. This really is a classic and should be required viewing for everyone interested in Telugu cinema! 4 stars. This entry was posted in Tollywood and tagged Adventures without subtitles, Akkineni Nageshwara Rao, ANR, Classics, Devadasu, Devdas, Lalitha, S.V. Ranga Rao, Savitri, Telugu, Vedantam Raghavaiah. Bookmark the permalink. After reading this review, I watched a VCD of the film that I have produced by Video Krishna Hyderabad. It is not too bad. There is some background noise, Krishna and some rectangle are displayed at the top sometimes blocking the actors. But in the first part I did not notice any jumps. I think that the film was released in at some stage and better versions may be available. Surprisingly it still very watchable. I watched a couple of other movies like Suvarna Sundari which had great songs but I found them hard to watch. I live in Melbourne and if you are interested, you are welcome to borrow my VCD. I watched Patala Bhairavi and enjoyed it very much. Some of the words and dialogues became part of the Telugu language. 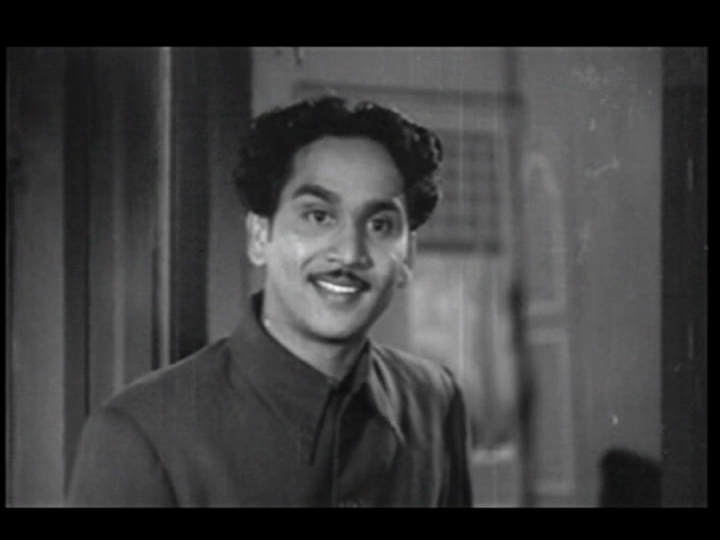 Pintail Nagendrarao is one of the great wordsmiths of Telugu films. I have not watched the other film yet though I watched several clips on YouTube. One film I am keen to watch is MLA which I missed when it came out. I heard that they found only one damaged copy and sent it to South Africa for restoration. Actually I have been out of Andhra since 1956 and watched only a few films. Around the time I left, they were getting pretty bad but through blogs like Minai’s I found a few that I enjoyed. I haven’t seen MLA nor do I know much about it. What is it about? Do you think it might be available on DVD or VCD? Wow ! Gadde Swarup is one old man ! It is from 1957.I think that it is about deterioration in politics possibly similar to ‘Peddamanushulu’1954. 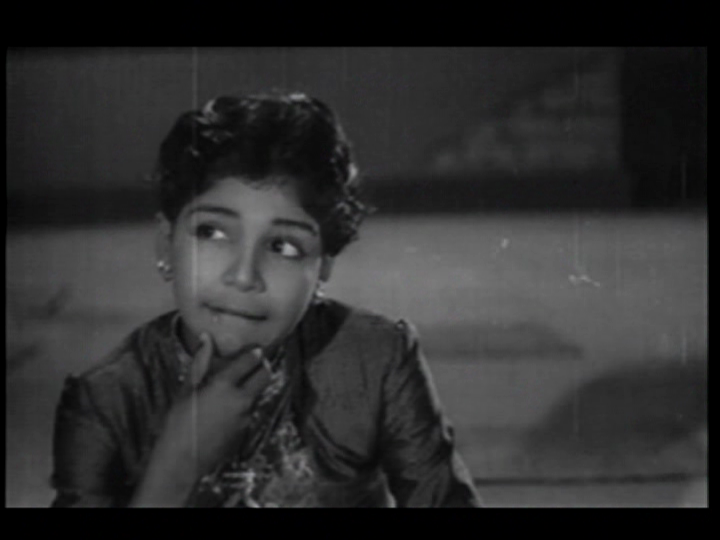 MLA also has a famous song ‘nee Asa adiyasa’ by Ghantasala and S.janaki, her first film song. For me the part of the attraction is songs and dances often adopted for the common man. They are in simple Telugu and the dances are diluted to be attractive to most people not just elites. I studied in Telugu medium in school and still read Telugu books and enjoy the language. I do not think videos of MLA are available now but may be available in future. There are not even video clips on YouTube. Some of the songs seem to appeal to the very young too; one of my granddaughters likes songs from Jagadekaveeruni Katha.